Brickell Key is a triangular shaped island at the mouth of the Miami River in Miami, Florida. The condos on Brickell Key define urban island living at its finest. These prestigious condominiums sit within walking distance to Downtown Miami’s Financial District in a private, refined and secluded setting with parks, shopping and fine dining. Each Brickell Key condo has been carefully designed to include the best views of Miami, with Biscayne Bay on one end and The Miami River on the other. Once you cross the Brickell Key Bridge and go past the security gate, you will immediately know you are in a different world, one of luxury, privacy, safety and always just a stone’s throw from Miami’s urban core. There are a number of Brickell Key condos on the island and each has its own private amenities from valet-parking, concierge, swimming pools, spas, gyms, racquetball, tennis courts, billiards, and much more. Brickell Key Miami condos offer the very best in luxurious architecture and lifestyle as well as one of the most unique and delightful island communities in the world. Brickell Key is an ideal and central location. Aside from being so close to its Brickell Ave and Downtown Miami neighbors, it is just minutes away from Miami Beach, South Beach, Coconut Grove, Coral Gables and Miami International Airport. Brickell Key condos showcase amazing views of the Biscayne Bay and there are a many delightful shops and restaurants on the island well. Brickell Key living is tranquil, scenic and convenient. On this private island you will find lush tropical landscaping surrounds with beautiful architecture and design. Enjoy relaxing walks contemplating the sunset or early morning jogs around the island’s walking path. Island amenities include a market place, restaurants, dry cleaners, beauty salon and even a flower shop. In addition, you will also find on Brickell Key, the celebrated Mandarin Oriental Hotel, with its exclusive restaurants: Azul, Café Sambal, M-Bar and of course it’s world-renowned and only Five-Star Spa in the Miami. 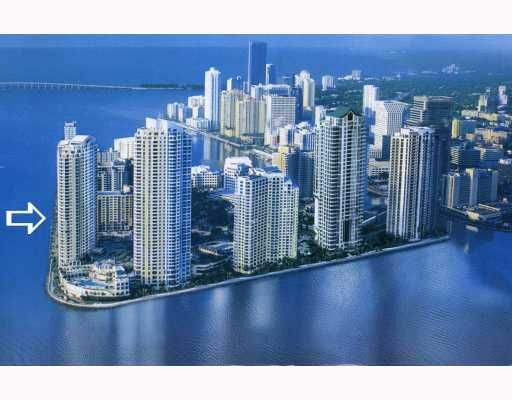 Miami’s Brickell Key luxury condos are comparable to the most exclusive properties in the world. Surrounded by water, condo residences provide beautiful unobstructed bay, ocean and city views. Concierge and valet parking is standard in all Brickell Key condos and a shuttle bus service circulates around the area. Brickell Key is just east of the financial district, and the Miami International Airport, the University of Miami, and internationally-acclaimed medical facilities are easily accessible as well. The Bayside Entertainment Complex, American Airlines Arena - home of the Miami Heat, and Downtown Miami are within arm’s reach from each of the Brickell Keys private residences. Brickell Key condos feature fabulous living on an exclusive island in the very heart of Miami. A vibrant international city that is yours to enjoy or escape - within seconds from Downtown Miami cross the bridge to Brickell Key and you have instantly escaped to an elegant island resort. Notable residences on the island include the Asia Condo – built in 2008 and one of the most exclusive properties on the Island. Carbonell and Courvoisier Courts are also popular Brickell Key condominiums as are One Tequesta Point, Two Tequesta Point, and Three Tequesta Point. Other noteworthy Brickell key condos include Brickell Key One, Brickell Key Two, Isola, and St. Louis Condo. Presently, Brickell Key consists of eleven luxury condominiums and two office buildings. Brickell Key condos offer immediate access to everything that beautiful Miami has to offer. From fine dining to fun and entertainment, Brickell Key has it all. When you decide to permanently reside in a Brickell Key condo, you will be moving to an area that will give you access to everything you need to live a rewarding and fulfilling lifestyle. If you are looking to live in the very lap of luxury then check out a Brickell Key condo and experience a tropical urban Miami lifestyle as it was meant to be lived! Steve Samuels is known as one of the premier Brickell Key Real Estate & Brickell Key Condo Brokers in the South Florida market. His negotiation skills, market knowledge and no-nonsense, results-driven approach has made him one of the most sought after luxury condominium, Oceanfront, Beachfront Condos, Oceanfront Villas, and single family waterfront realtors from Hallandale, Sunny Isles Beach, Miami, to Palm Beach County. View MLS Listings for Hallandale, Downtown Miami, South Beach, Sunny Isles, Miami Beach Condos for Sale in South Florida and Miami Beach. CondosandCondos.com is one of the Leading Sunny Isles Baech Real Estate websites where you can find Waterfront, Bayfront, Beachfront Condo Sales, Oceanfront Condos Sales & Rent . Search for Oceanfront Condos Luxury Condos in Miami, Miami Beach, South Beach, Sunny Isles, Hallandale, Key Biscayne, Bal Harbour, Fisher Island, Coral Gables, Ocean Drive and all of South Florida.